First, we added new localizations of Korean, Serbian and simplified Chinese languages. Second, we added a very helpful feature which might be an impetus for re-thinking of ad blocking as a whole. This is the feature “Invert whitelist”. 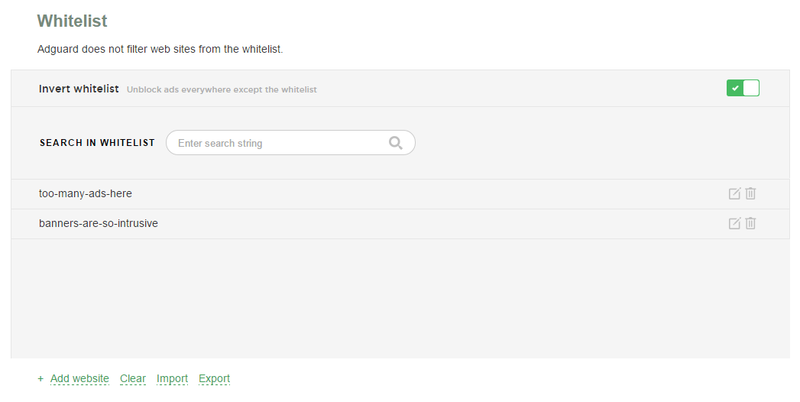 First, let’s recall what a whitelist is. It is a list of websites which you trust and want to support, and which you allow to display ads. Such a list is still present in our extension, we have just added the possibility to invert it. This means that when this feature is enabled, the ads are not blocked on added websites. But they are blocked on other websites (which are not on the list). You have some interesting websites, where ads are not intrusive. You would love to support these websites and thus add them to whitelist. And so the ads there are not blocked. But how does the inverted whitelist work? You add websites, where you encounter plenty of really annoying advertising elements (like on Youtube), and now Adguard will block ads on these websites. But it won’t block ads on all other websites which are not on the list. Why do we need this feature? We just wanted to give a tool to responsible users, who see the complete ad blocking in the Internet as a problem. They have a point to some extent, as many sites make their living on the ad banners. By using our whitelist such users have an opportunity to adjust filtering only on the websites where ads look highly intrusive. Actually, the idea of responsible ad blocking is rather interesting, and perhaps we will continue research in this direction. Install Adguard extension on our official website.